Accorinti, Giuseppe. 2008. Quando Mattei era l’impresa energetica io c’ero. 3. ed. Matelica: Hacca. Andrew D. Roberts. 1976. A History of Zambia. London: Heinemann. Bailey, Martin. 1976. Freedom Railway: China and the Tanzania-Zambia Link. London: Rex Collings. Bank, The World. 1966. “Zambia - Highway Reconstruction Project.” TO525. The World Bank. http://documents.worldbank.org/curated/en/721101468334889784/Zambia-Highway-Reconstruction-Project. ———. 1969. “Tanzania - Second Highway Project.” TO690. The World Bank. http://documents.worldbank.org/curated/en/837811468119658831/Tanzania-Second-Highway-Project. ———. 1976a. “Annexes.” 490. The World Bank. http://documents.worldbank.org/curated/en/305771468167969319/Annexes. ———. 1976b. “Main Text.” 490. The World Bank. http://documents.worldbank.org/curated/en/315711468166454706/Main-text. ———. 1976c. “Main Text.” 490. The World Bank. http://documents.worldbank.org/curated/en/315711468166454706/Main-text. Bini, Elisabetta. 2013. La potente benzina italiana: Guerra Fredda e consumi di massa tra Italia, Stati Uniti e Terzo mondo (1945-1973). Roma: Carocci. Cohen, Andrew. 2014. “Britain and the Breakdown of the Colonial Environment: The Struggle over the Tanzam Oil Pipeline in Zambia.” Business History Review 88 (4): 737–59. https://doi.org/10.1017/S0007680514000749. Cooper, Frederick. 2002. Africa since 1940: The Past of the Present. New Approaches to African History. Cambridge: Cambridge University Press. Easterling, Keller. 2014. Extrastatecraft: The Power of Infrastructure Space. London: Verso. Gallagher, John, and Ronald Robinson. 1953. “The Imperialism of Free Trade.” The Economic History Review 6 (1): 1–15. https://doi.org/10.2307/2591017. Gardiner, Robert K. A. 1973. “DISTANCE AND DEVELOPMENT.” Africa: Rivista Trimestrale Di Studi e Documentazione Dell’Istituto Italiano per l’Africa e l’Oriente 28 (1): 25–34. Gewald, Jan-Bart. 2008. One Zambia, Many Histories: Towards a History of Post-Colonial Zambia. Vol. 12. Afrika-Studiecentrum Series. Leiden: Brill. ———. 2009. The Speed of Change: Motor Vehicles and People in Africa, 1890-2000. Vol. 13. Afrika-Studiecentrum Series. Leiden: Brill. http://sfx.metabib.ch/sfx_locater?sid=ALEPH:EBI01≥nre=book&isbn=978-90-474-3079-7. Gleave, M. B. 1992. “The Dar Es Salaam Transport Corridor: An Appraisal.” African Affairs 91 (363): 249–67. Hance, William A., and Irene S. van Dongen. 1956. “The Port of Lobito and the Benguela Railway.” Geographical Review 46 (4): 460–87. https://doi.org/10.2307/212105. Hansen, Karen Tranberg. 1997. Keeping House in Lusaka. New York: Columbia University Press. Hecht, Gabrielle. 2011. Entangled Geographies: Empire and Technopolitics in the Global Cold War. Inside Technology. Cambridge, MA: MIT Press. Kay, George. 1967. A Social Geography of Zambia: A Survey of Population Patterns in Developing Country. London: University of London Press. Lunn, Jon. 1992. “The Political Economy of Primary Railway Construction in the Rhodesias, 1890-1911.” The Journal of African History 33 (2): 239–54. Mbembe, Achille. 2013. “Necropolitics.” Public Culture 15 (1): 14–40. Monson, Jamie. 2009. Africa’s Freedom Railway: How a Chinese Development Project Changed Lives and Livelihoods in Tanzania. Indiana University Press. https://muse.jhu.edu/book/3894. Sachs, Wolfgang. 2010. The Development Dictionary: A Guide to Knowledge as Power. 2nd ed. London: Zed Books. Shaw, Timothy M. 1982. “Beyond Neo-Colonialism: Varieties of Corporatism in Africa.” The Journal of Modern African Studies 20 (2): 239–61. Simmance, Alan J. F. 1972. Urbanization in Zambia. An International Urbanization Survey Report to the Ford Foundation. https://eric.ed.gov/?id=ED079459. Staples, Amy L. S., and Amy L. Sayward. 2006. The Birth of Development: How the World Bank, Food and Agriculture Organization, and World Health Organization Changed the World, 1945-1965. Kent State University Press. “United Nations: Security Council Resolution Authorizing United Kingdom to Use Force to Prevent Oil Deliveries to Southern Rhodesia.” 1966. International Legal Materials 5 (3): 534–534. Viganò, Paola. 1999. La città elementare. Milano: Skira. Wallerstein, Immanuel Maurice. 2004. World-Systems Analysis: An Introduction. Durham: Duke University Press. Westad, Odd Arne. 2005. The Global Cold War: Third World Interventions and the Making of Our Times. Cambridge University Press. Giulia Scotto is a PhD candidate at the Urban Studies department at the University of Basel. She holds a master’s degree in architectural design from the IUAV (Istituto Universitario di Architettura di Venezia) University of Venice, and the ETSAB (ETSAB Escuela Técnica Superior de Arquitectura de Barcelona) of Barcelona. Prior to joining the University of Basel, Giulia worked as architect and urban planner for OMA– Office for Metropolitan Architecture (Rotterdam) and for KCAP architects & planners (Zurich). She has also worked as research assistantat the Urban Think Thank (UTT) chair of architecture and urban design at the ETH (Eidgenössische Technische Hochschule) Zurich. SCOTTO, Giulia. Colonial and Postcolonial Logistics. FOOTPRINT, [S.l. ], p. 69-86, nov. 2018. ISSN 1875-1490. Available at: <https://journals.open.tudelft.nl/index.php/footprint/article/view/2044>. Date accessed: 24 apr. 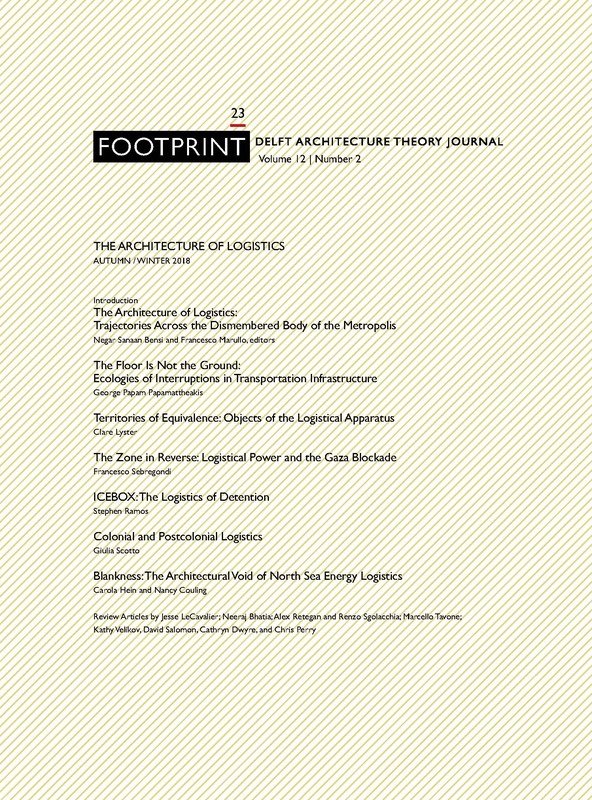 2019. doi: https://doi.org/10.7480/footprint.12.2.2044.